Original Dark Shadows actresses Lara Parker (Angelique) and Kathryn Leigh Scott (Maggie Evans) will be making a host of remote video appearances today across the US. 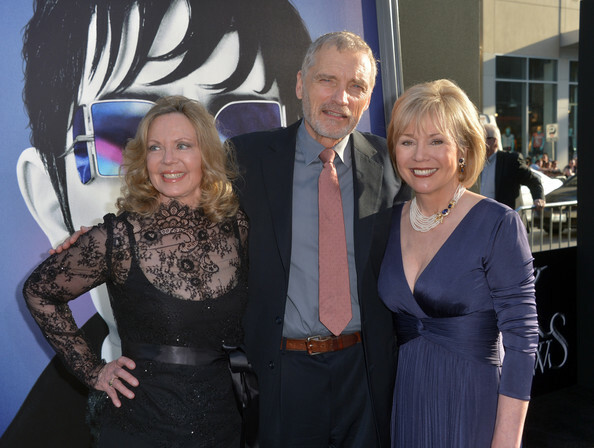 The pair, pictured right with David Selby (Quentin Collins) at the Dark Shadows movie premiere on Monday, will discuss their days on the 1960s series and filming their cameo roles in the new Dark Shadows movie. They will also be pre-recording appearances for NBC Newsfeed (all NBC news channels); Fox News Edge; Reelzchannel Hollywood Dailies; ATPN Newsfeed; MYN 2 News on 49 (Buffalo WNYO-TV); Unifour Tonight (Charlotte WHKY-TV); NBC 9 News at Noon (Denver KUSA-TV); ABC 13 Eyewitness News (Houston KTRK-TV); Valley Happenings (Huntsville WYAM-TV); NBC Hometown Today (Joplin KSNF-TV); ABC The Morning Blend (Las Vegas KTNV-TV); Fox Studio 10 (Mobile WALA-TV); CBS Talk Philly (Philadelphia KYW-TV); Better Philly (Philadelphia WPHL-TV); CBS Daybreak (Portland, WGME-TV); NBC 207 News Magazine (Portland WCSH-TV); CBS Studio 10 (Tampa WTSP-TV); ABC Good Morning Oklahoma (Tulsa KTUL-TV). Love Lara's black lace dress. Would love to see the whole thing. I'm glad they're able to get out there and promote Dark Shadows and reminisce about their experience on the show. They all look great! Just caught it online! So interested to learn I come from Dark Shadows land. Wow, they're really making the rounds in the media - Kathryn and Frank Borzellieri (The Physics of Dark Shadows) were guests for an hour on Coast To Coast with George Noory several nights ago. Awesome & lovly photo premiere/on the Carpet shot of Lara Parker, Kathryn Leigh-Scott and David Selby DARK SHADOWS legends appearing and promoting the new DARK SHADOWS Movie. They look marvelous/enchanting: looking forward to seeing the movie. And continue success to everything DARK SHADOWS: Wow, they Ms. Scott & Ms. Parker are gonna be quite busy-bees Touring during interviews on all those Radio & Talk Shows. That's great!!!! !